E-Prime has the ability to create a Joystick Device from Experiment Object's Devices tab so that responses can be made through the joystick without using port communications. USB joysticks and gamepads are fully supported. 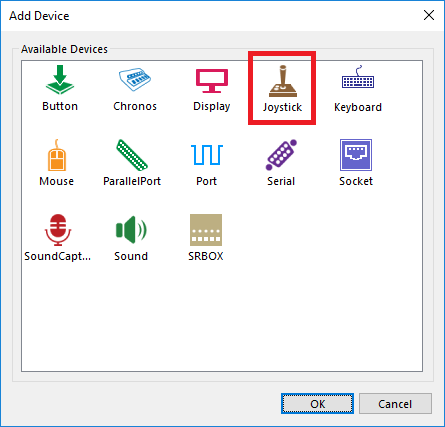 The device must be recognized in Windows as a Human Interface Device, Joystick, or Gamepad. The Joystick Device currently supports 8 separate button responses, polling for X/Y coordinates, and access to POV and slider controls in E-Prime. NOTE: The device supports four separate button responses as well as polling for X/Y coordinates in E-Prime 2.0 Standard. The device appears in the "Add Devices" dialog. To access it, double-click the Experiment Object at the top of the Structure window, navigate to the Devices tab, and click the "Add" button. NOTE: The use of more than one JoyStick Device is supported in E-Prime 3.0 and E-Prime 2.0 Professional. The Joystick device can be added as an input mask in E-Prime to any RteRunnableInputObject (e.g., Wait, TextDisplay, ImageDisplay, Slide, SoundOut, MovieDisplay) in the same manner as any other response collection device. Open the RteRunnableInputObject's Property Pages, navigate to the Duration/Input tab, and click the "Add" button immediately below the list of Input Mask Devices. 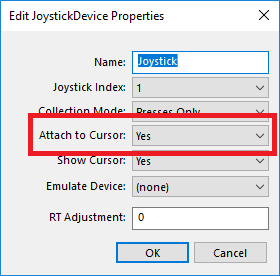 In the Add Input Device dialog box, select the Joystick and click "OK". The Joystick device will be attached to the mouse cursor and controlled by the joystick/gamepad. NOTE: The Joystick Device contains a property to attach the position of the Joystick to the Cursor. The image below shows this property. RESP The number corresponding to the button pressed for this particular response. RT The reaction time value of the response in relation to the onset time of the object collecting the response. RTTime The reaction time value of the response in relation to the start of the experiment. IsButton1-8 Returns a Boolean value (i.e. True or False) in regards to whether the specified button was pressed at the time of the response. For example, JoystickResopnseData.IsButton2 returns True if button 2 is pressed at the time of the response. While a JoystickResponseData object corresponds to only a single response, these properties can return True for multiple buttons if they are all depressed at the time of the response. For example, if button 2 is depressed at the start of the experiment and held until the Stimulus object appears, and then button 3 is also pressed, IsButton2 and IsButton3 both return True, even though the RESP property reports only 3. CursorX Returns the X joystick position as it relates to a pixel on the screen. If using a 1024x768 resolution, this property returns a value between 1024 and 768. CursorY Returns the Y joystick position as it relates to a pixel on the screen. If using a 1024x768 resolution, this property returns a value between 1024 and 768. Slider1-2 Returns the value of the corresponding slider control from 1-10. For example, if the slider control designated as 1 on the joystick is held in position 7, JoystickResponseData.Slider1 reports 7. Below is an example of the script used to access and log the various properties available from a Joystick device response. Note that this script assumes that the object collecting the response is named Stimulus. 'Log whether button 1 and/or 2 was pressed at the time of this response. 'Log response, reaction time, and response location. 'Log POV and Slider values. 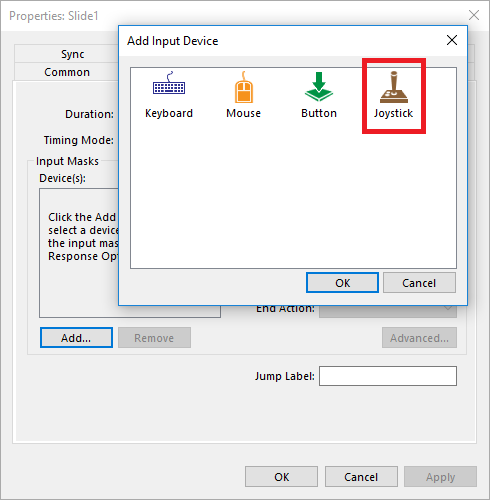 Adding the Joystick device as an input mask is onlyavailable in E-Prime 2.0 Professional and E-Prime 3.0. Script is necessary to collect joystick responses in E-Prime 2.0 Standard (this can also be done in E-Prime 2.0 Professional and E-Prime 3.0, but using the JoystickResponseData type is preferred). NOTE: The joystick is linked to the mouse cursor and thus Mouse.GetCursorPos is used.